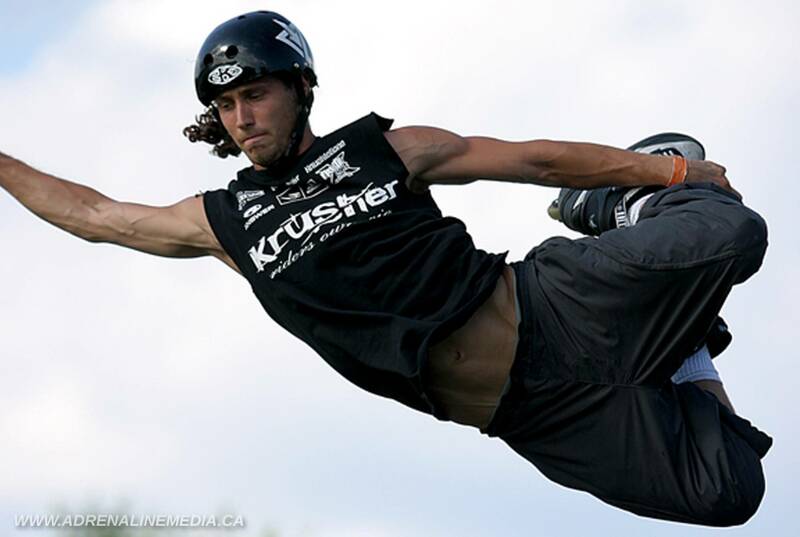 The KRUSHER Stunt Team his a remarkable presentation of skill, courage and rashness. 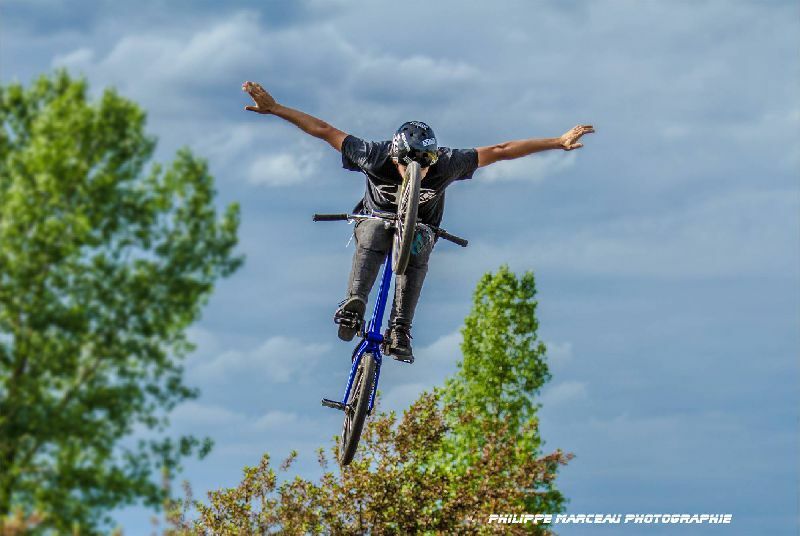 These intense shows will divert any audience and our professional athletes are always ready to give their best of themselves, they are devote and dedicate for the public satisfaction as each rider combine experience, talent, and positive attitude. 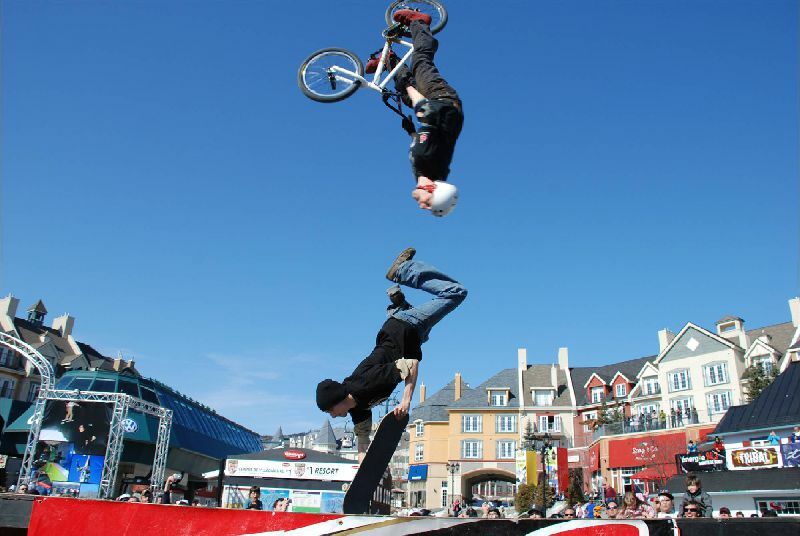 The Stunt team will offer you extreme demonstrations that will leave you breathless with flips and spin at unbelievable height! A few minutes before the demos, the MC announces the time remaining until the beginning of the next presentation in order to gather the maximum number of spectators. After the warm-up, the MC will set the tone by announcing the sponsors and the beginning of the presentation, followed by the individual presentation by the athletes performed to the music. 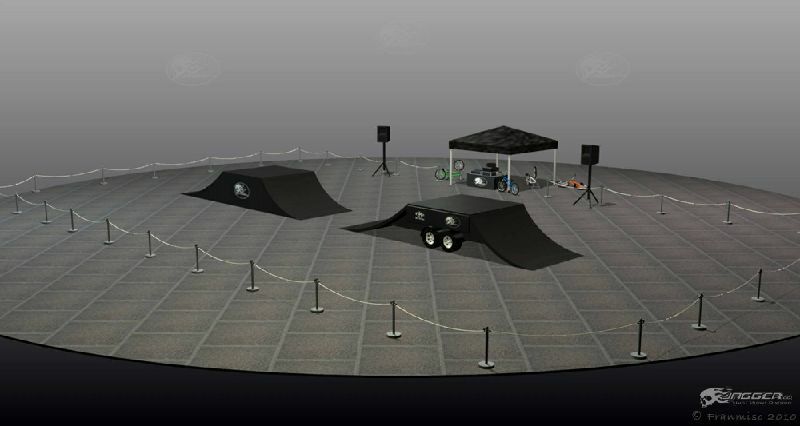 The MC will also provide information on the demonstrations so that the spectators have the impression that they are part of the show. 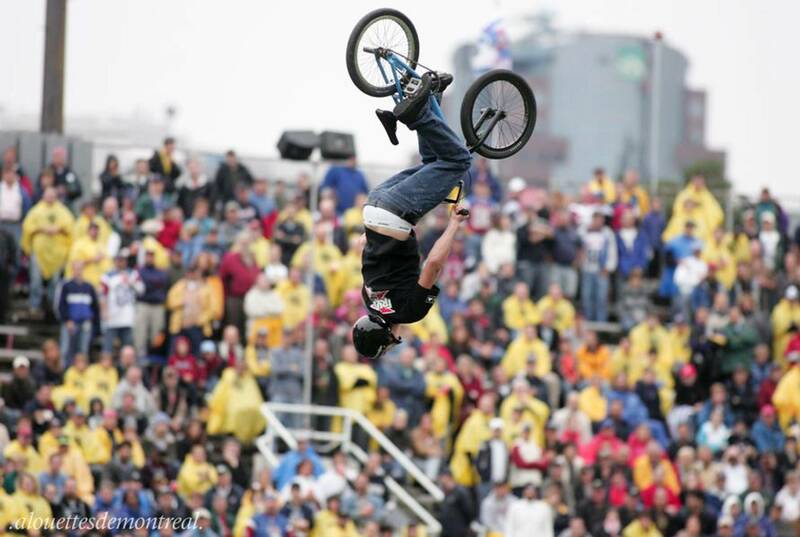 The crowd will be amazed by technical maneuvers on the flat ground. The ramp is introduced and lip-tricks are performed. The last flatland runs are performed. 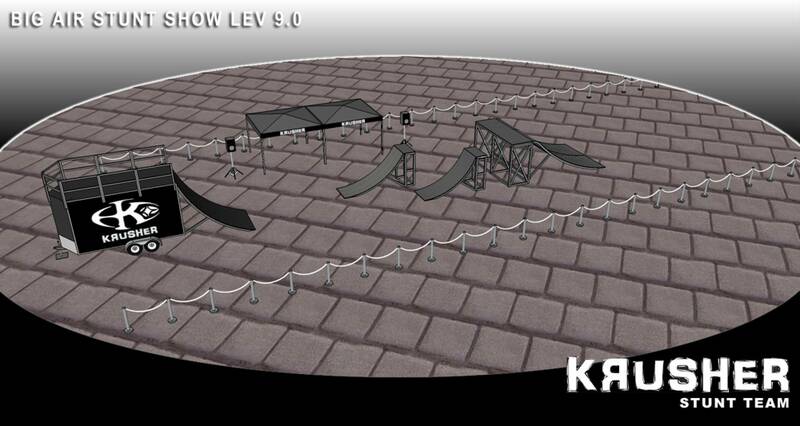 Last but not least the ramp is used for the most spectacular part of the show; the high flying stunt. This is the highlight demo, the crowd will see daredevil flying thought the air at the height of 15 feet and performing stunts such as 360 degree turns, tailwhips, barspins and of course the back flip witch will throw them into a screaming frenzy. 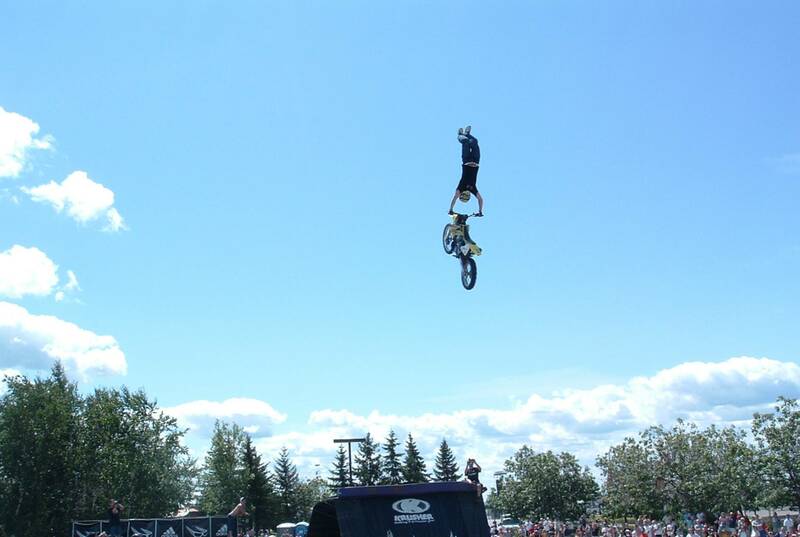 Twenty minutes of extreme entertainment are provided by performers and one announcer, one-three shows per day. 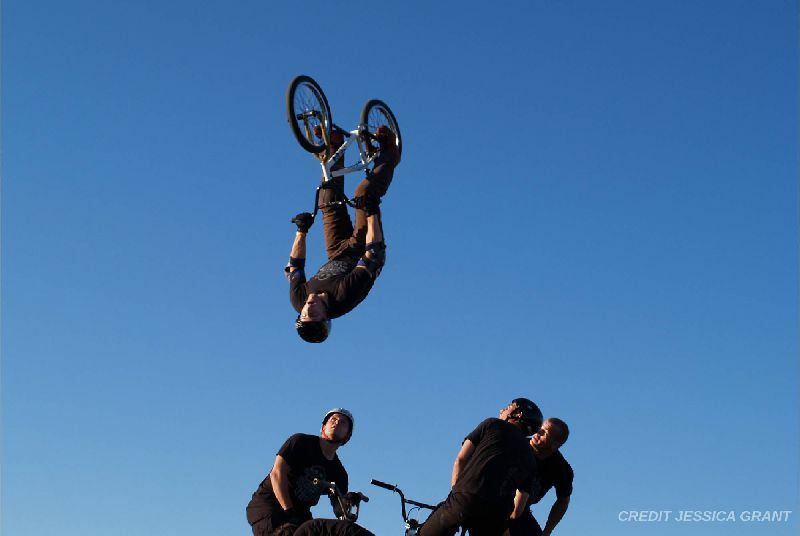 The Stunt Shows Division’s spectacular equipment is secure as well as impressive, and is designed to propel our athletes to their highest limits of performance, all under the constant supervision of a trusted stunt coordinator. We have multiple foldable ramps trailer for a fast set up and tear down. Athletes always take times with kids and public after each show, sharing autographs, post cards, stickers and take pictures. Festivals. Fairs. Schools special day. Schools year end animation. Back to school. National holidays. Canada Day. Sports events. Half-time shows. Indy race. Family day. 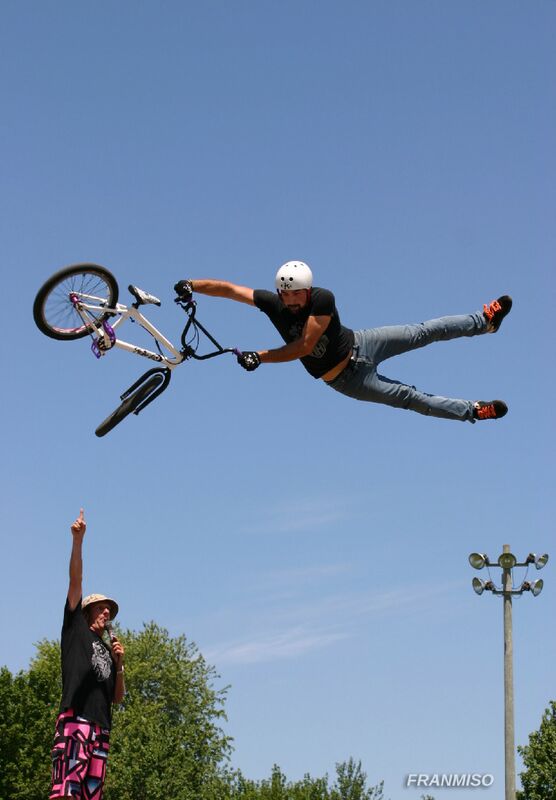 Cycling event. Ski & MTB resort. Youth Games. 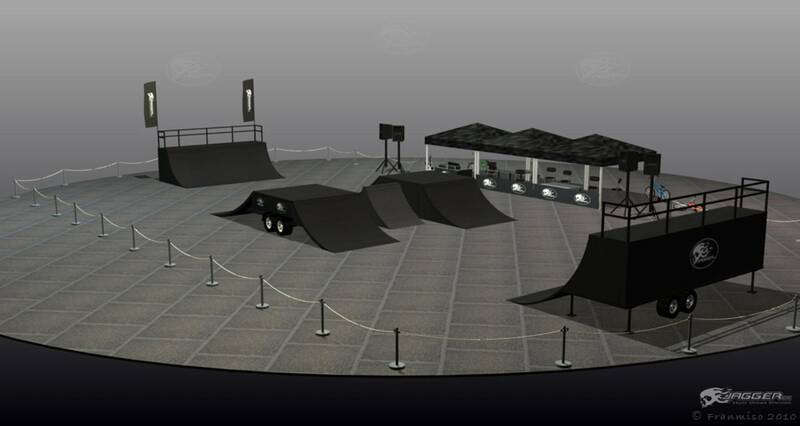 Skatepark inauguration. Attraction park. Summer camp. Corporation holidays party. Private events. Octoberfest. 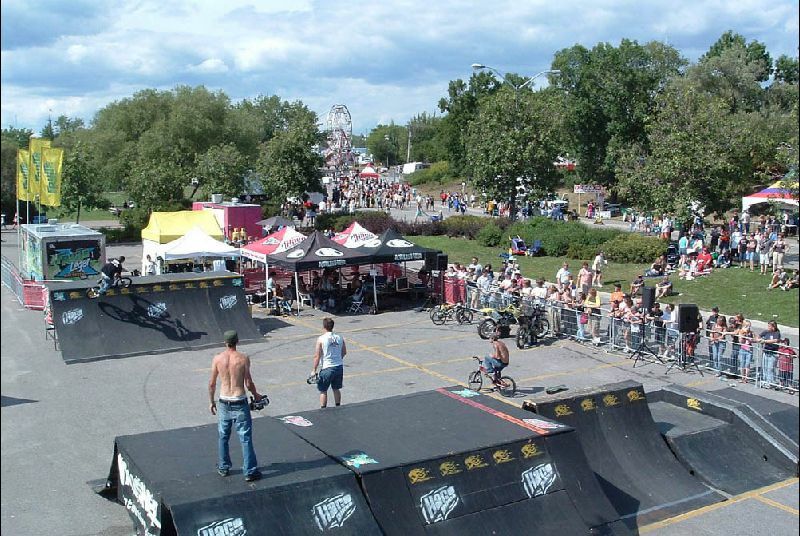 Rockfest. 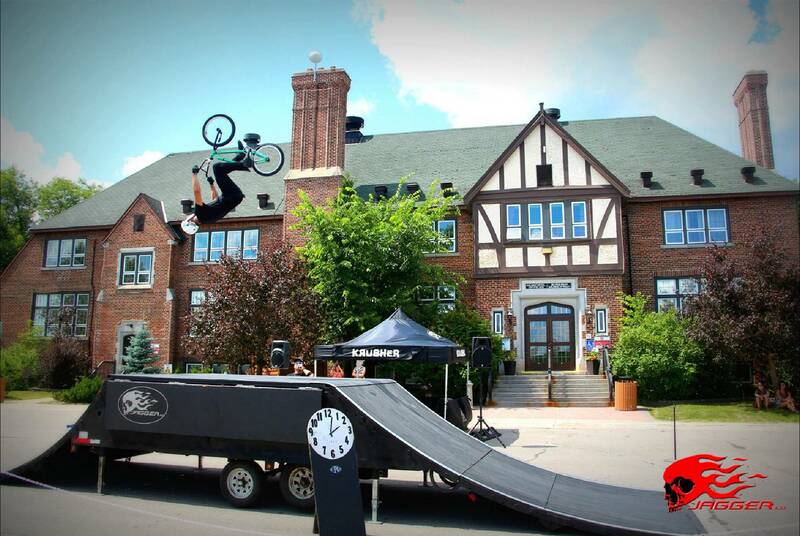 “We were incredibly thrilled with the event & the addition that Jagger riders added to it. Our shows have been crucial entertainment components for some of the country’s largest events. 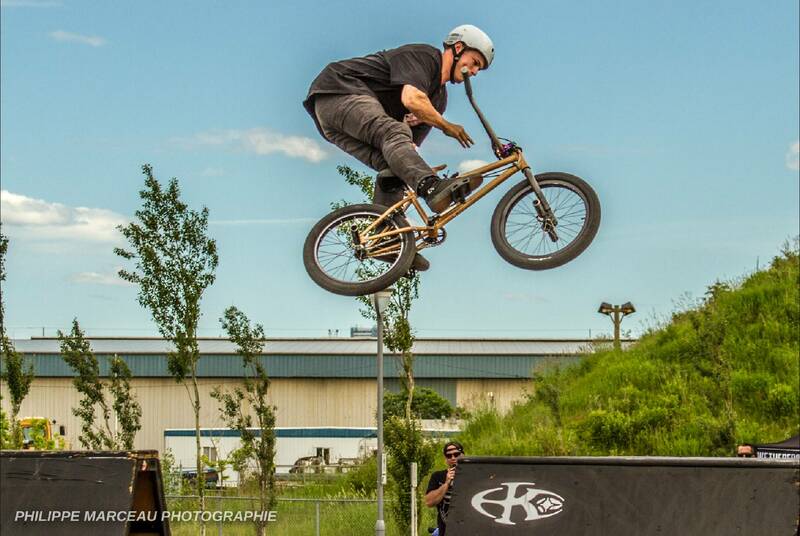 We have a selection of over fifteen packages, including BMX, MTB, Skateboard, Inline and Motocross shows, that suit any taste or budget, as well as a roster of thirty professional athletes renowned worldwide. 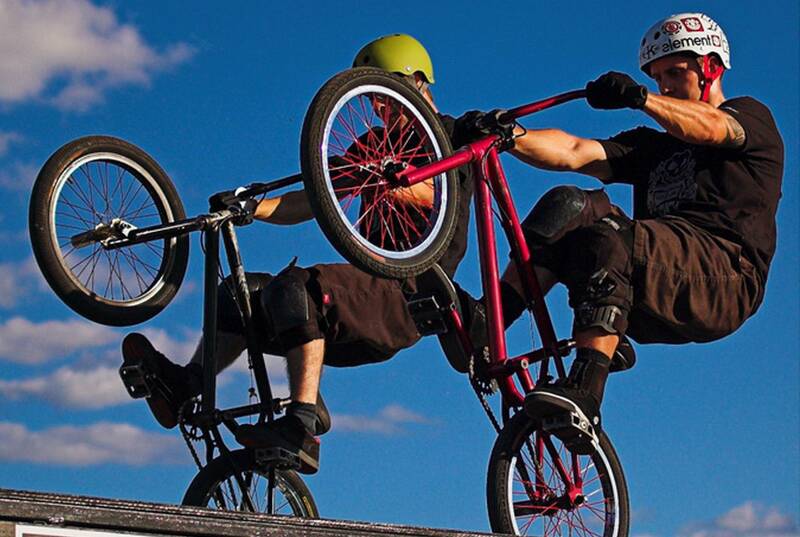 Our FLATLAND BMX and FREESTYLE SKATEBOARDING package showcases acrobatic maneuvers that are linked together as they are performed on the ground, both as duo and solo routines. 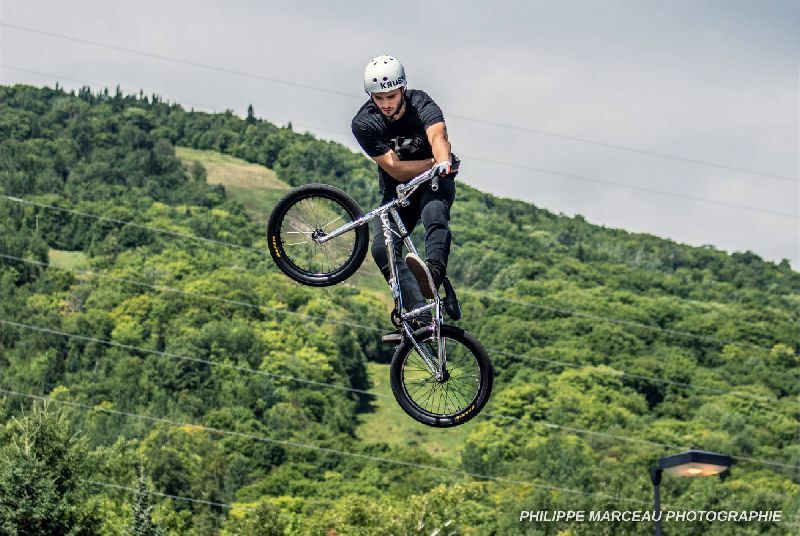 You will be blown away at the speed at which the riders execute these combinations, and with the integration of a professional announcer, the level of intensity and interaction with the spectators with skyrocket! 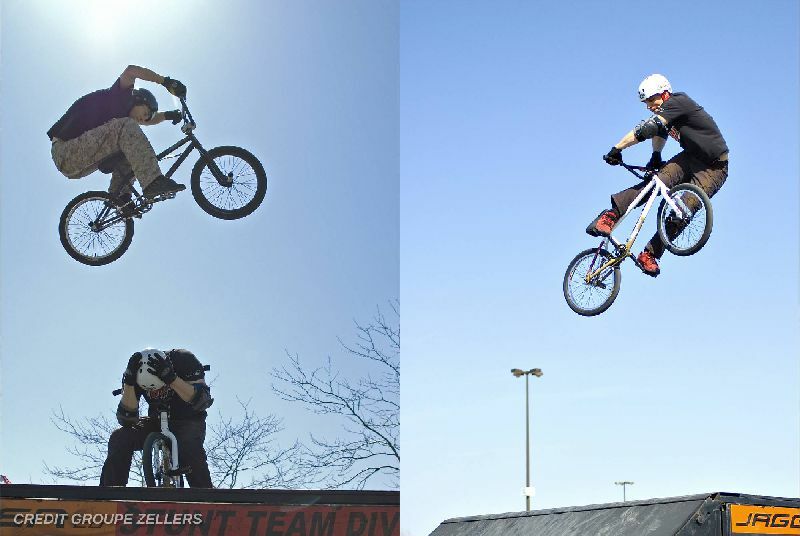 2 FLATLAND BMX or SKATEBOARD athletes (your choice of combination). 1 MC. Three 10-minute demos performed to music + interaction after each shows. 20’ x 25’ minimum. Asphalt,medium or superior quality concrete. 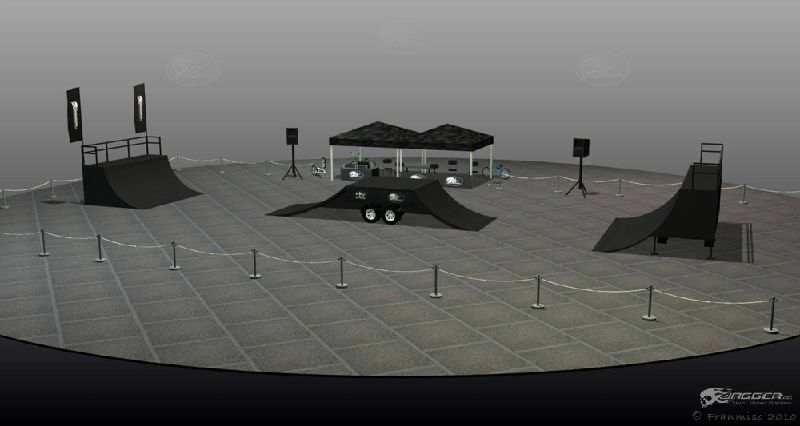 Pit area. Security zone. 1500-watt audio system. 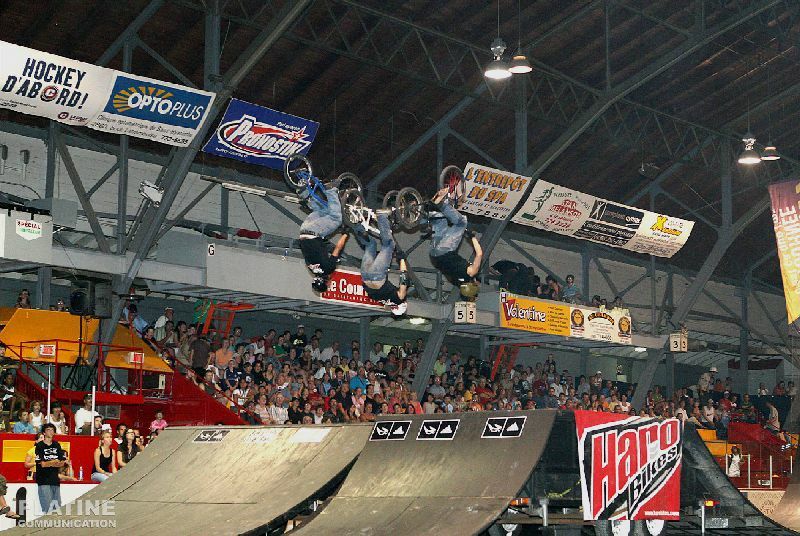 Our three BMX athletes repeatedly charge the box jump at full speed, propel themselves to unbelievable heights, and execute a variety of aerial maneuvers that will leave you breathless! 3 BMX athletes. 1 commentator. Two 15-minute demos within a 3-hour block + interaction after each shows. 20’ x 120’ minimum. High-quality asphalt, concrete. Our three BMX athletes repeatedly charge the box jump at full speed, propel themselves to unbelievable heights, and execute a variety of aerial maneuvers that will leave you breathless! 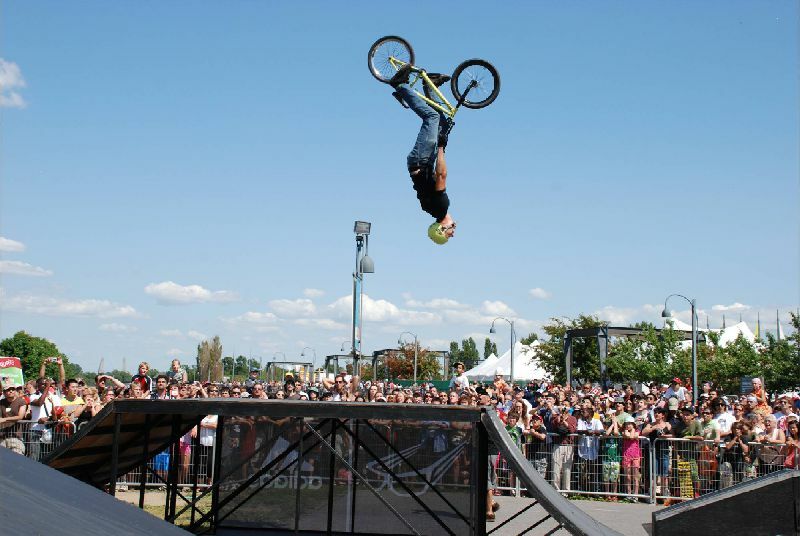 The integration of a professional announcer will increase the level of intensity of the show and facilitate interaction with the spectators, while our FLATLAND athlete dazzles you with his repertoire of stunt combinations. 3 BMX athletes. 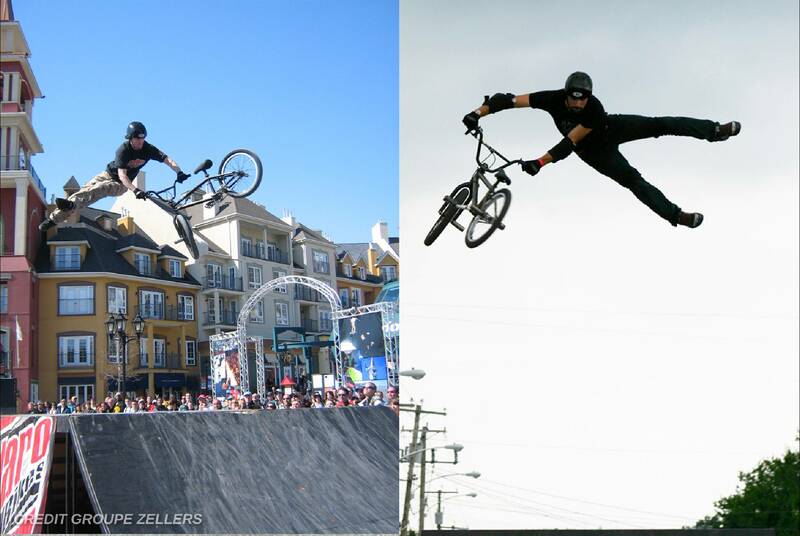 1 BMX FLATLAND or SKATEBOARD athlete. 1 MC. Two 20-minute demos within a 5-hour block + interaction after each shows. 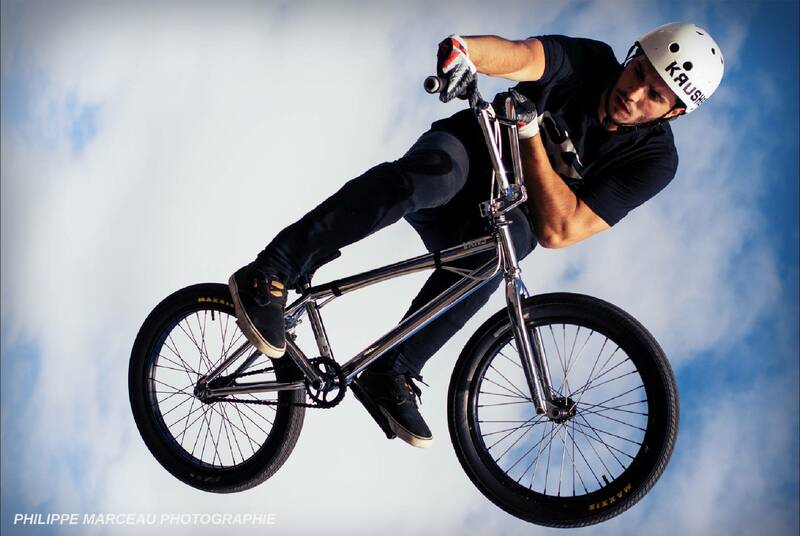 Our four BMX athletes charge the first box jump at full speed, propel themselves to unbelievable heights, and execute a variety of aerial maneuvers that will leave you breathless! As if the action wasn’t already at its peak, the riders perform an additional series of acrobatic maneuvers on the second jump box! The integration of a professional announcer will increase the level of intensity of the show and facilitate interaction with the spectators. 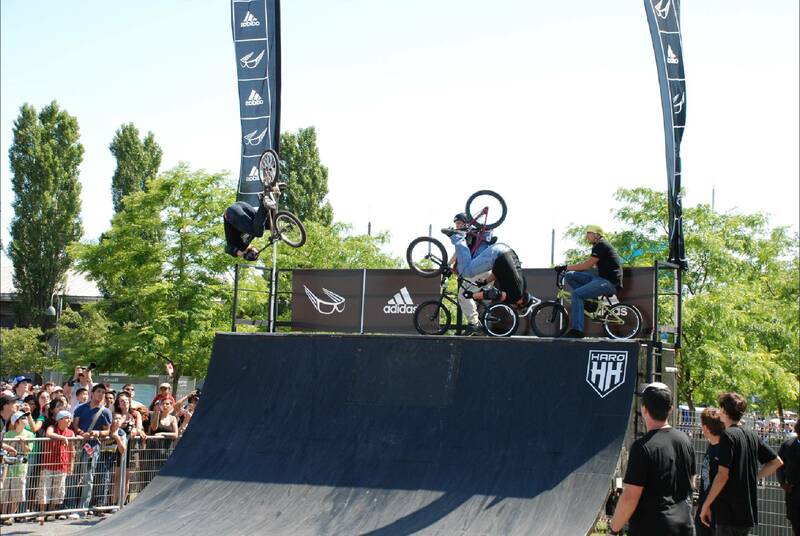 4 BMX athletes. 1 MC. Two 20-minute demos within a 5-hour block. 20’ x 160’ minimum. High-quality asphalt, concrete. Two Jump Box Trailer 35’ x 12’. 3000-watt audio system. 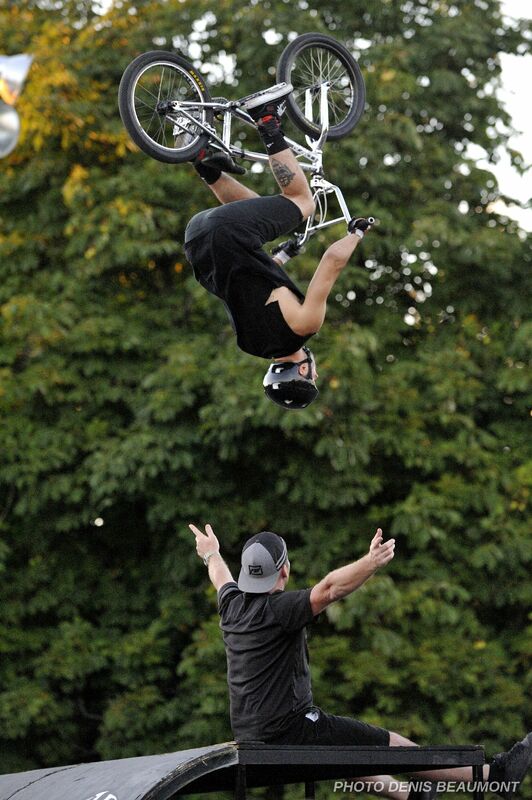 The PRO Stunt Show is an even more diabolical version of the LEVEL 4 show. An enormous ¼ pipe added to the extremity of the course not only accelerates the pace of the show, but allows for a wider variety of maneuvers to be performed as well. 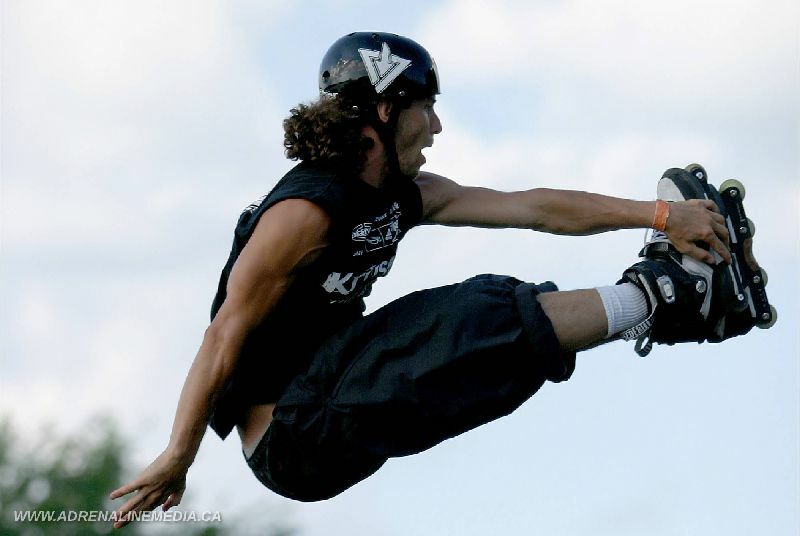 An additional IN-LINE SKATER or FLATLANDER further increases the number of acrobatic stunts performed. 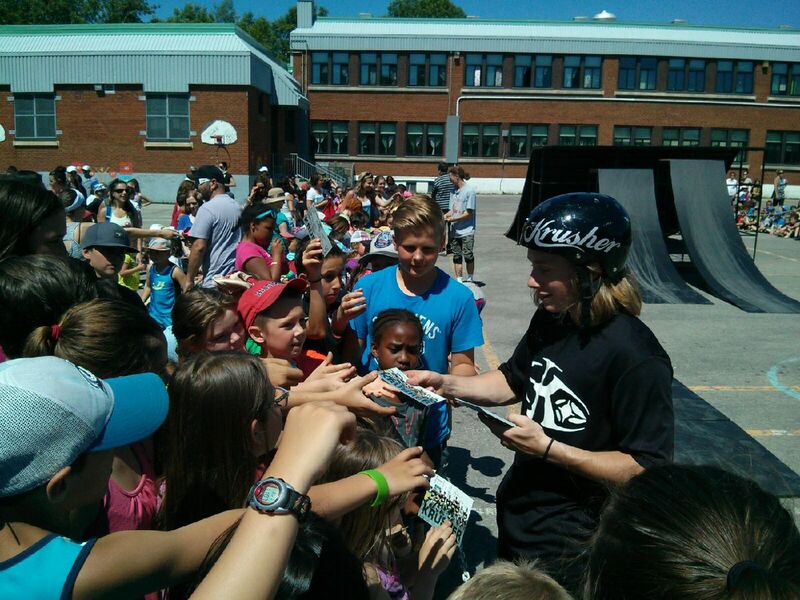 4 BMX athletes. 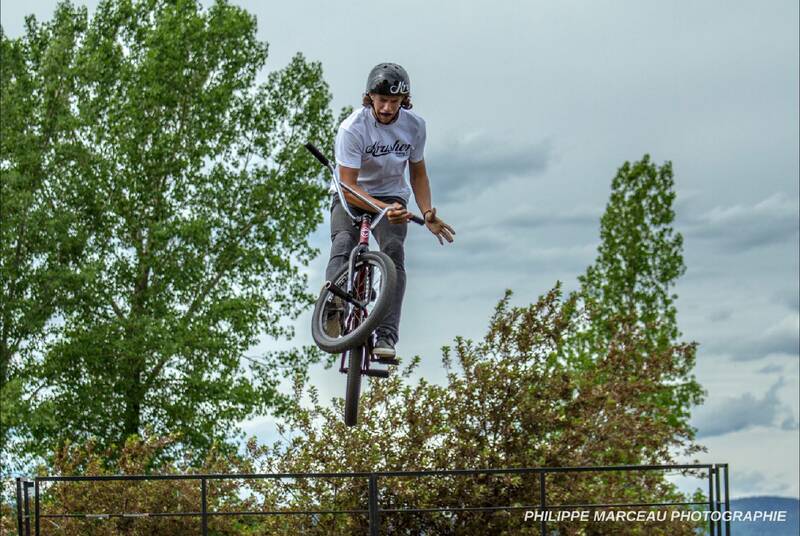 1 BLADE / FLATLAND athlete. 1 MC. 1 TM. 1 Technician. 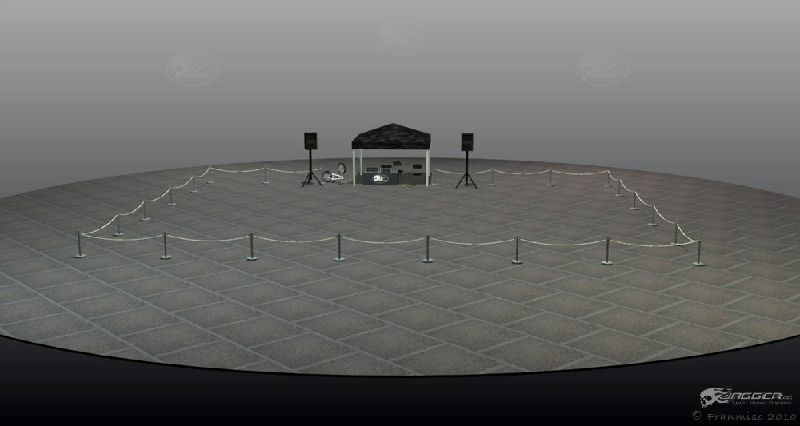 Two 20-minute demos within a 5-hour block + one animated warm-up + interaction after each shows. 20’ x 110’ minimum. High-quality asphalt, concrete. Now we’re bringing in the heavy artillery! 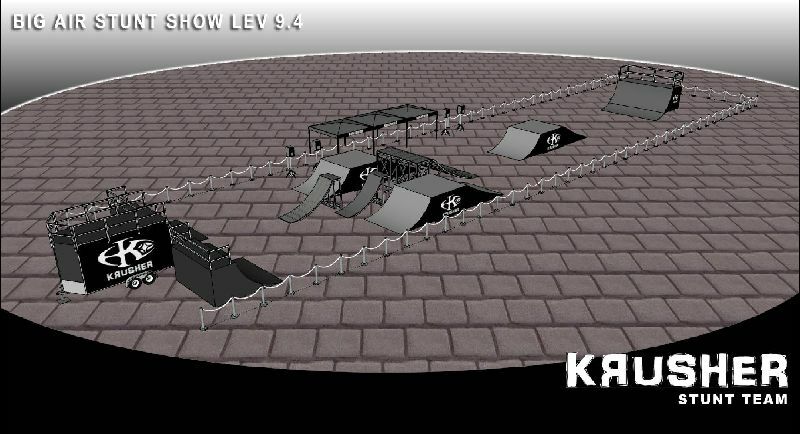 A huge 22-foot ramp trailer provides the foundation for a fast-paced show with a plethora of maneuvers, and with a ¼ pipe at each end of the course, continuous non-stop action is guaranteed! 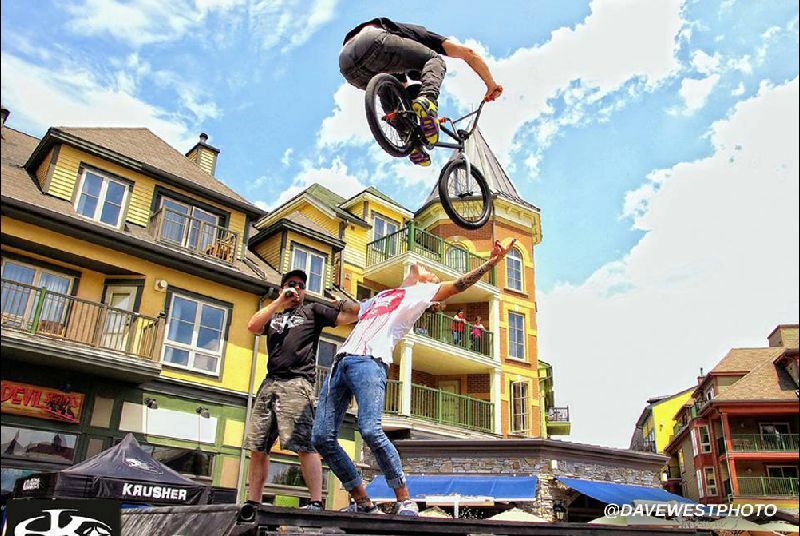 4 BMX athletes. 1 BLADE athletes. 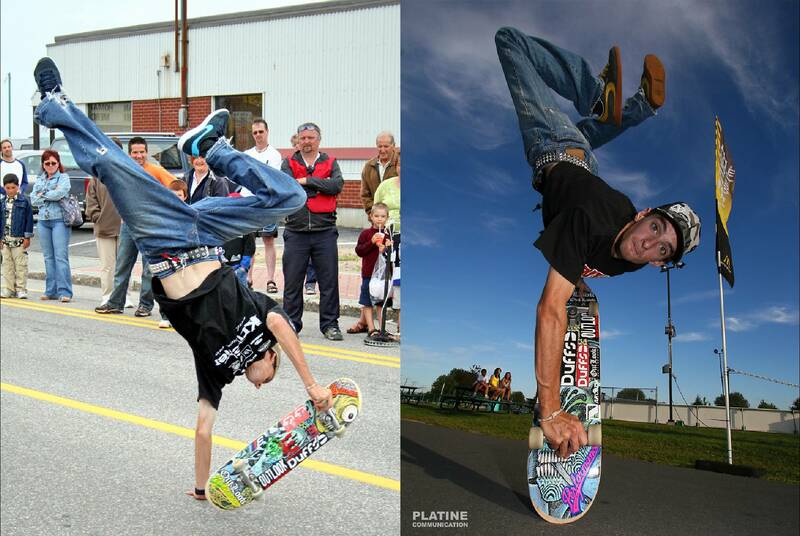 1 SKATEBOARD athlete. 1 MC. 1 TM. 2 Technicians. ¼ Pipe Trailer 20’ x 8’. Jump Box Trailer 35’ x 12’. ¼ Pipe 12’ x 6’. Pit area. 3000-watt audio system. This is the HUGE! 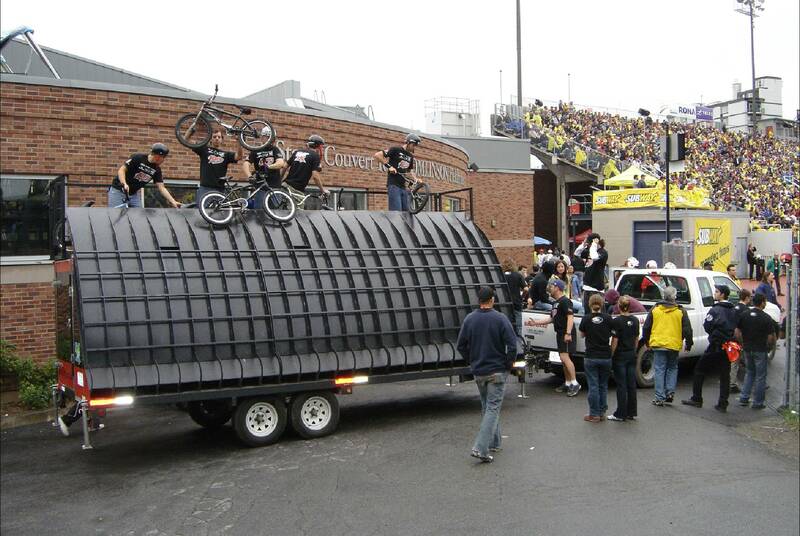 Two enormous trailers transport 20 000 lbs. of equipment and a team of 10 people! This is the ideal course for showcasing each discipline and maximizing the massive potential of our 6 professional athletes. ¼ Pipe Trailer 20’ x 8’. 2 Jump Box Trailer 35’ x 10’. ¼ Pipe 20’ x 6’. 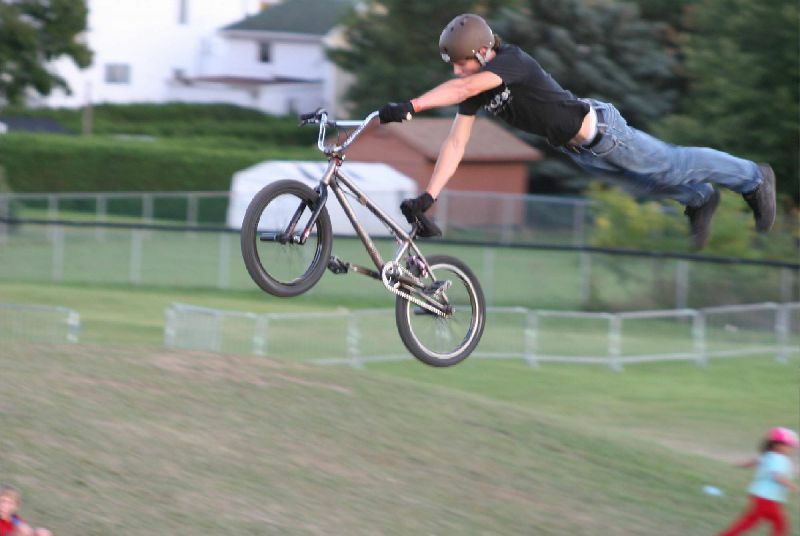 Wall ride 8’ x 12’. Pit area. 3000 - watt audio system. A whirlwind of athletes storm a course of four jump boxes as they destroy everything in their path, wrapping it all up with a tornado of frantic maneuvers on a large ¼ pipe. 6 athletes, 3 shows, 1 giant course. Breathlessness guaranteed !!! 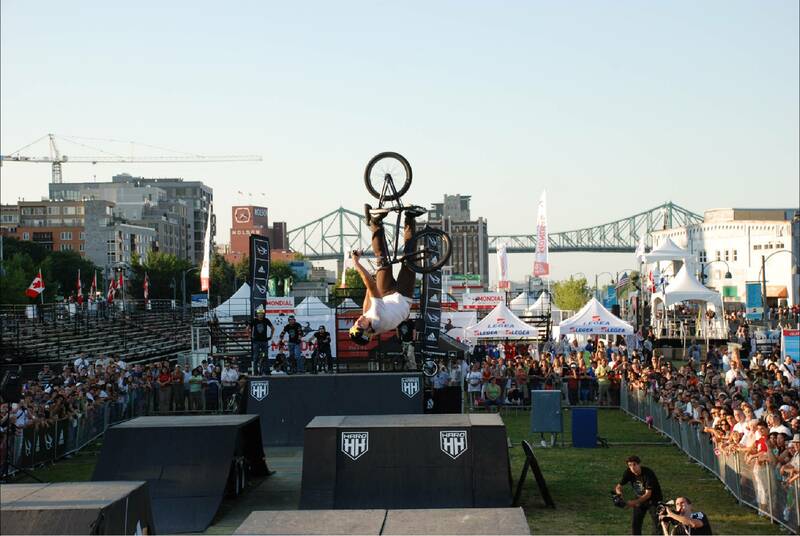 6 BMX athletes. 1 MC. 1 TM. 3 Technicians. Three 20 minute demos + interaction after each shows. 40’ x 200’ minimum. High-quality asphalt, concrete. The athletes are propelled at full speed from a massive 16’ x 8’ x 8’ roll Inn trailer into a Big Air ramp where they execute a variety of aerial manoeuvres at unbelievable heights. 4 athletes – 2 shows… total delirium guaranteed! 4 BMX athletes. 1 MC. 1 TM. Two 20-minute demos + interaction after each shows. 30’ x 125’ minimum. High-quality asphalt, concrete. Trailer Roll Inn 16’ x 8’ x 8’. 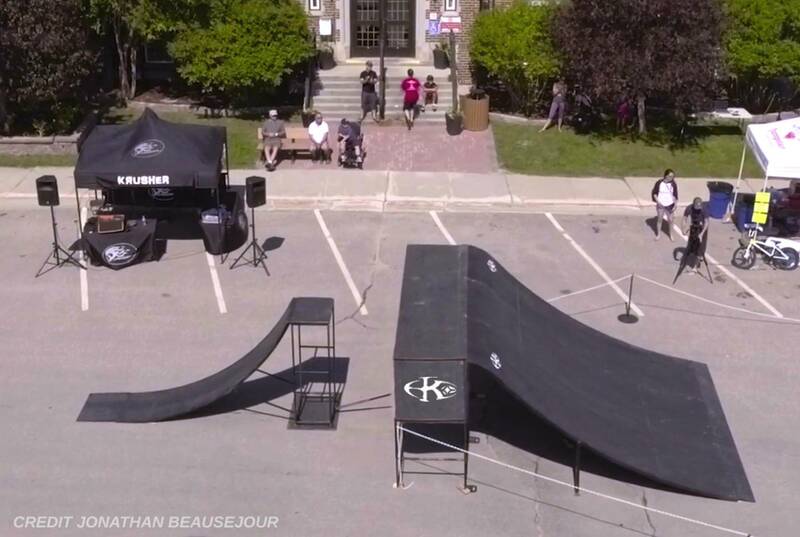 Big air ramp 35’ x 12’. Take off ramp 3’ x 6’. Pit Area. 3000-watt audio system. The athletes are propelled from a massive 16’ x 8’ x 8’ Roll Inn trailer into a Big Air ramp where they execute a variety of aerial manoeuvres that end on an large 20’ x 8’ quarter pipe. 4 athletes – 2 shows… total delirium guaranteed! 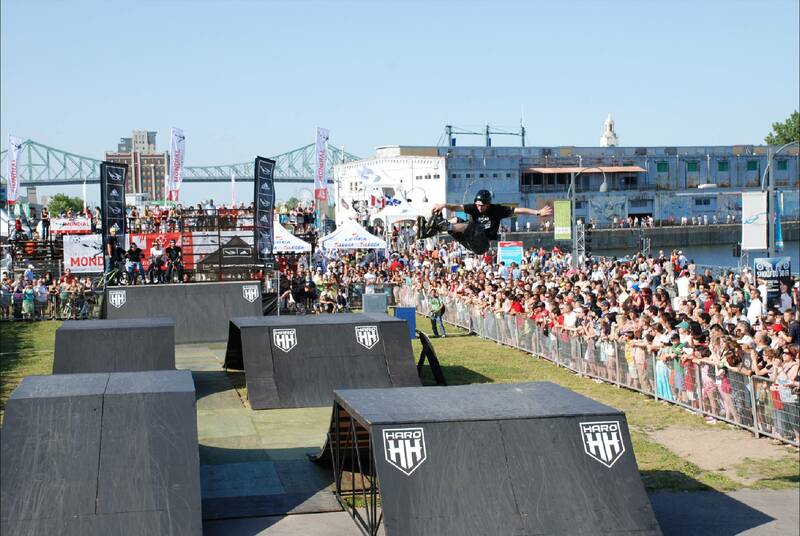 The athletes are propelled at full speed from a massive 16’ x 8’ x 8’ Roll Inn trailer into a Big Air ramp where they execute a variety of aerial manoeuvres! 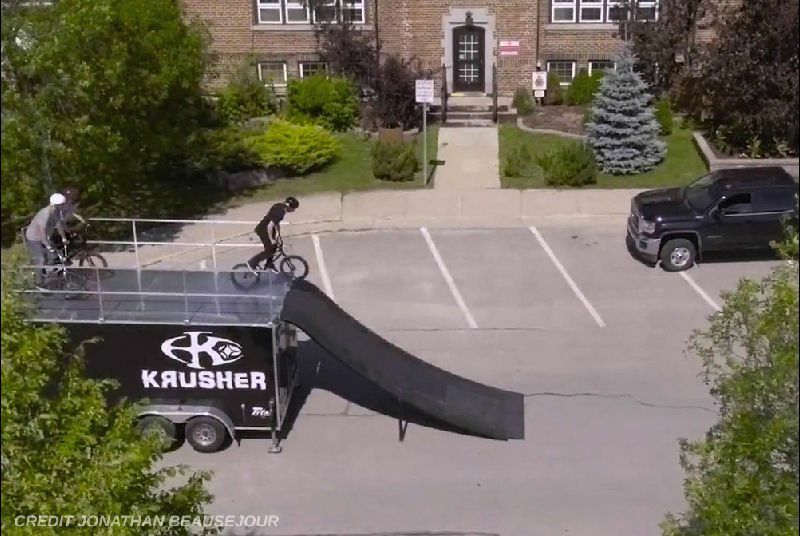 As if the action wasn’t already at its peak, the riders perform an additional series of acrobatic maneuvers on the second jump box witch ends in an enormous 20’ x 8’ quarter pipe trailer. 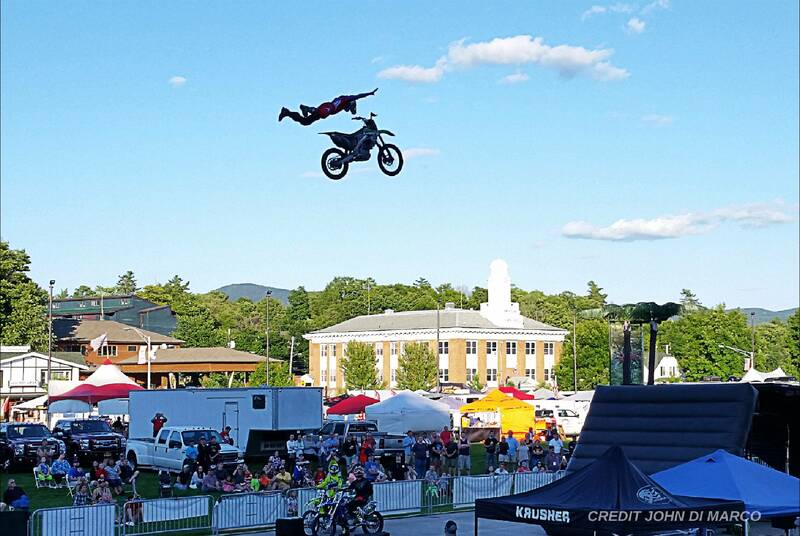 5 athletes – 3 shows – 1 big course… total delirium guaranteed! Three 15-minute demos + interaction after each shows. 30’ x 175’ minimum. High-quality asphalt, concrete. Take off ramp 3’ x 6’. 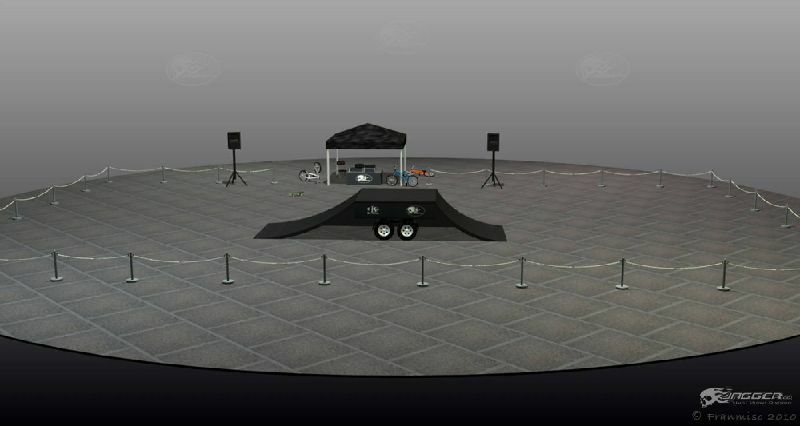 Pit Area. 3000-watt audio system. BIG/GROS (grossus) adj. : having significant dimensions; large in size in relation to others of the same nature. 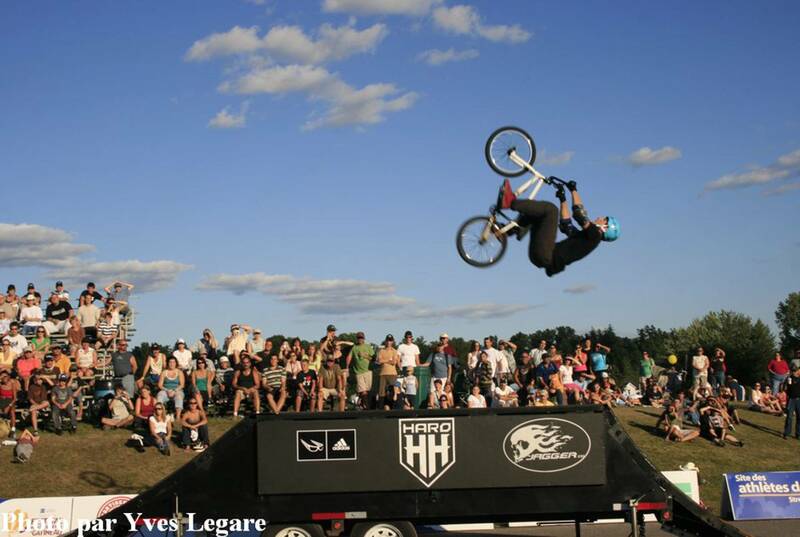 4 trailers, 25 000lbs of equipment, 8 professional athletes, 4 technicians, 2 demos and one HUGE finale. BIG … very, very BIG!! 6 BMX athletes. 2 BLADE athletes. 1 MC. 1 TM. 4 Technicians. Two 20-minute demos and one 30-minute finale + interaction after each shows. Trailer Roll Inn 16’ x 8’ x 8’. 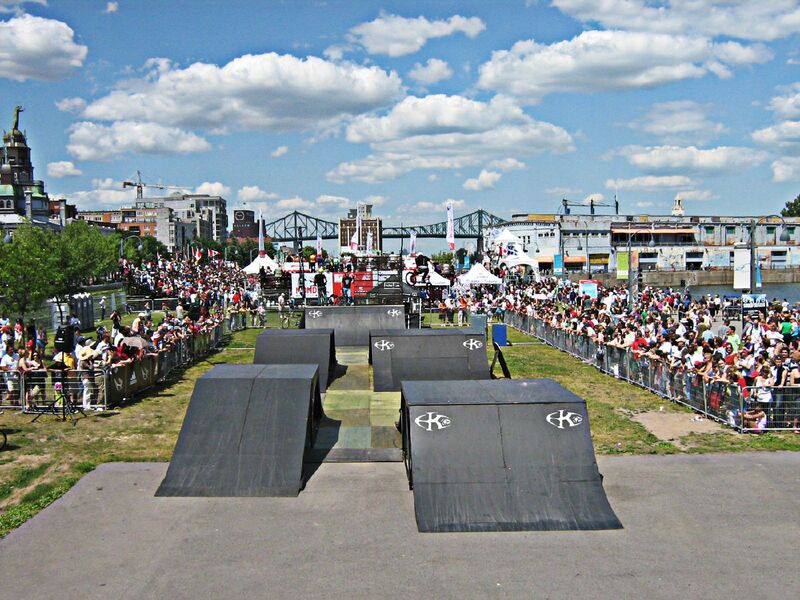 Big Air ramp 35’ x 12’. 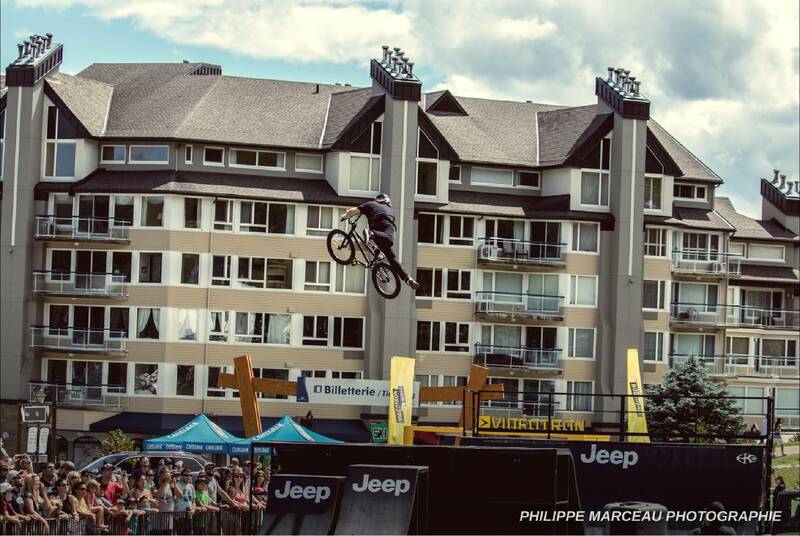 (Three) Big Jump Box 45’ x 10’. ¼ Pipe Trailer 20’ x 8’. (Three) Take off ramp 3’ x 6’. (Two) 12’ x 6’ ¼ Pipe. 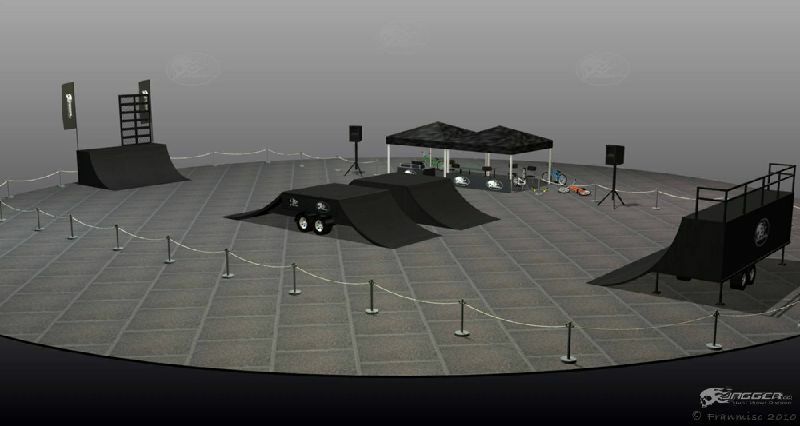 Pit Area. 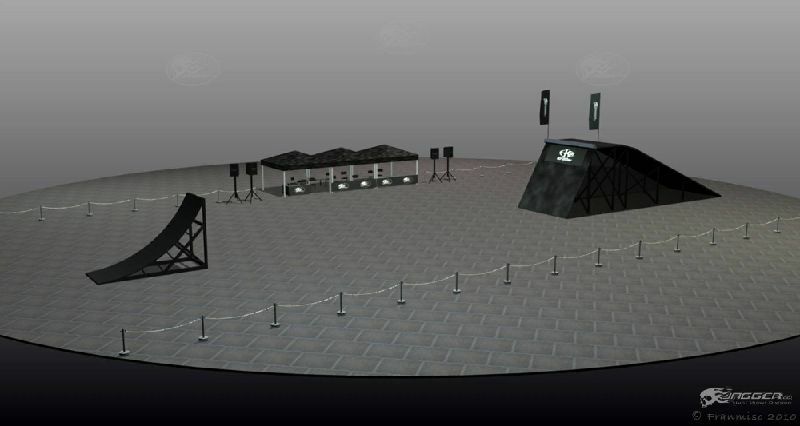 3000W audio system. 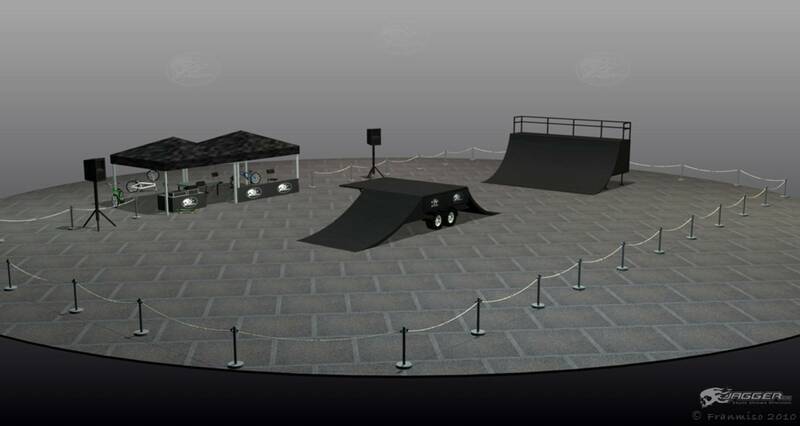 If you’re interested in offering a spectacular day-long event with animation, then here is the solution : six BMX, IN-LINE and SKATEBOARD shows performed at pre-determined times throughout the day, and ending with one “super show” combining all of the sports as the Grande finale. 12 athletes. 1 MC. 1 TM. 3 Technicians. Three 15-minute demos and one 30 minute finale + interaction after each shows. ¼ Pipe Trailer 22’ x 8’. 2 Jump Box Trailer 35’ x 12’. ¼ Pipe 20’ x 6’. Spine 12’ x 5’. Pyramid 12’ x 12’. Wall ride 8’x 12 ‘. Pit area. 5000-watt audio system. 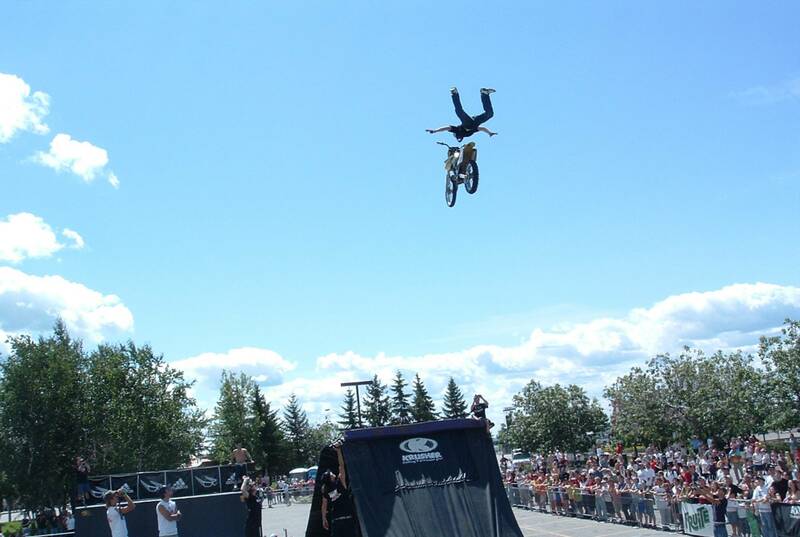 Our two MOTOCROSS riders accelerate as they attack the jump ramp that propels them to distances of approximately 100 feet and heights of 30 feet from the ground! As if the excitement wasn’t already at its peak, the riders add yet another level of danger by executing a series of acrobatic maneuvers. 2 FMX athletes. 1 MC. 1 TM. 2 Technicians. 300’ x 50’ minimum. Hard, even, compact ground. 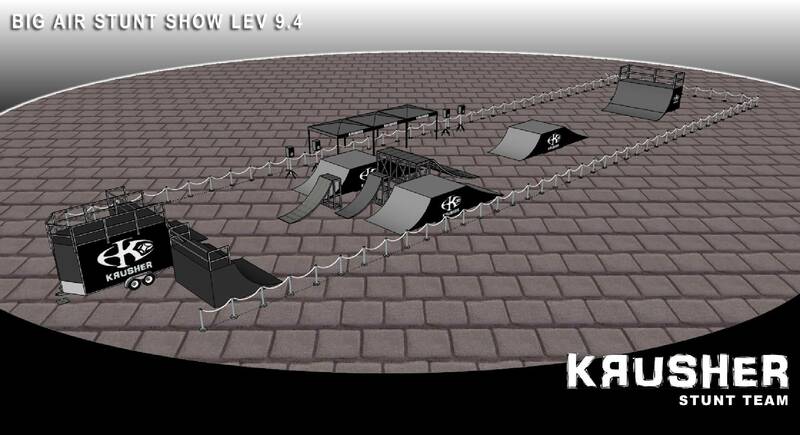 Jump Ramp 12’ x 18’. Landing Ramp Trailer 16’ x 15’ x 45’. Pit area/ . 3000-watt audio system. 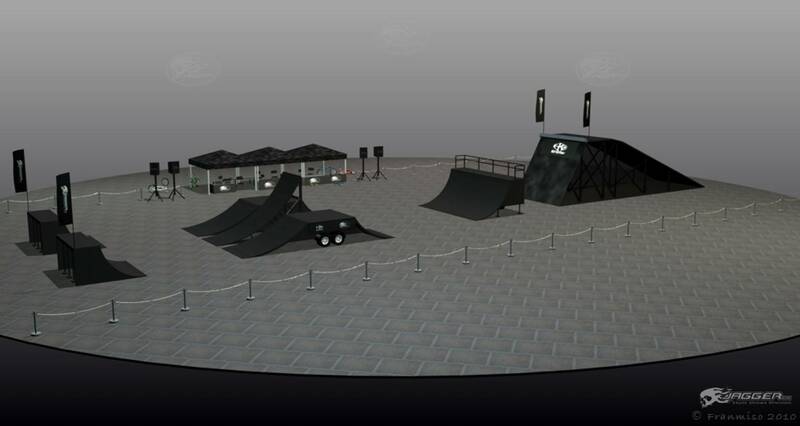 This gigantic show is a smaller-scale recreation of the famous “Extreme Games”, with BMX, in-line, skateboard and FMX athletes on one of the biggest mobile skate parks in North America! 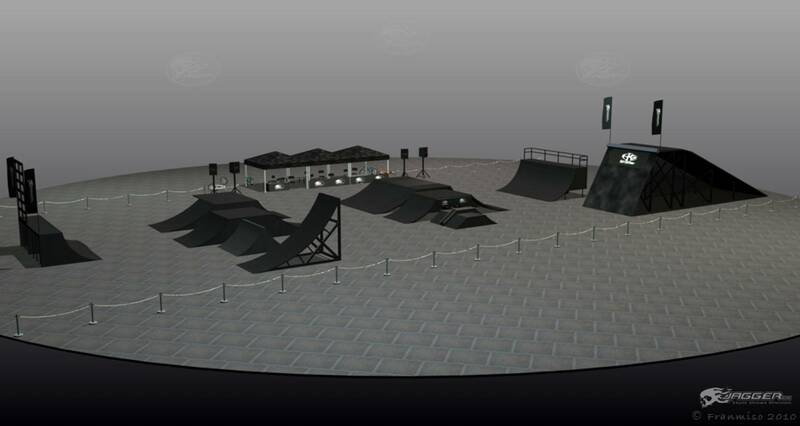 This out-of-this-world package includes two shows, and one huge finale where the FMX athletes fly over the street course, kamikaze-style, while it is erupting with stunts being performed by the BMX, in-line and skateboard athletes. Please take note that this show is not for the faint of heart!!! 300’ x 50’ minimum. High-quality asphalt, concrete. ¼ Pipe Trailer 20’ x 8’. 2 Jump Box Trailer 35’ x 12’. Two channel ¼ Pipe 12’ x 6’. 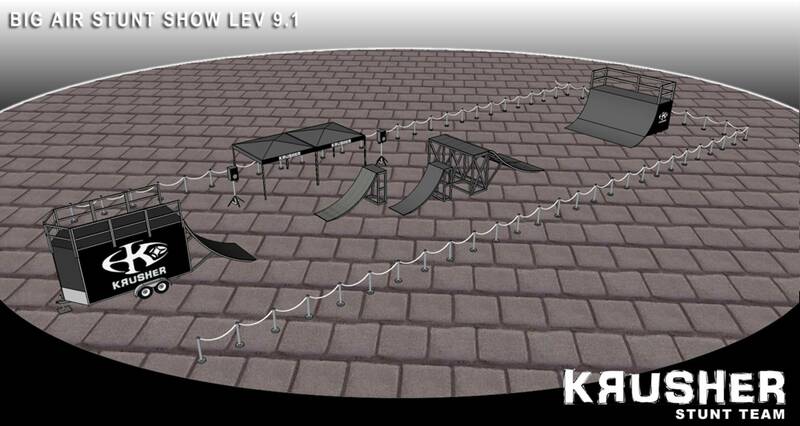 Jump Ramp 12’ x 18’. Landing Ramp Trailer 16’ x 15’ x 45’. Pit area. 5000-watt audio system. 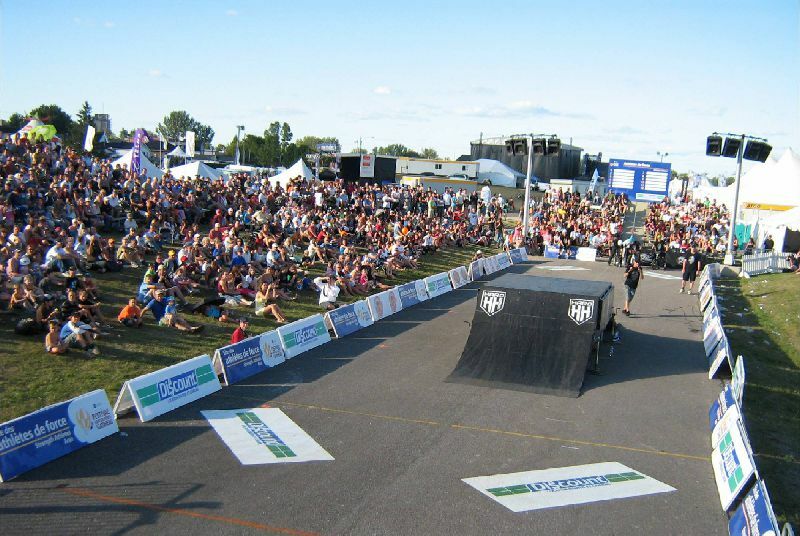 This gigantic show is a smaller-scale recreation of the famous Extreme Games, with BMX, in-line, skateboard and FMX athletes on one of the biggest mobile skate parks in North America! 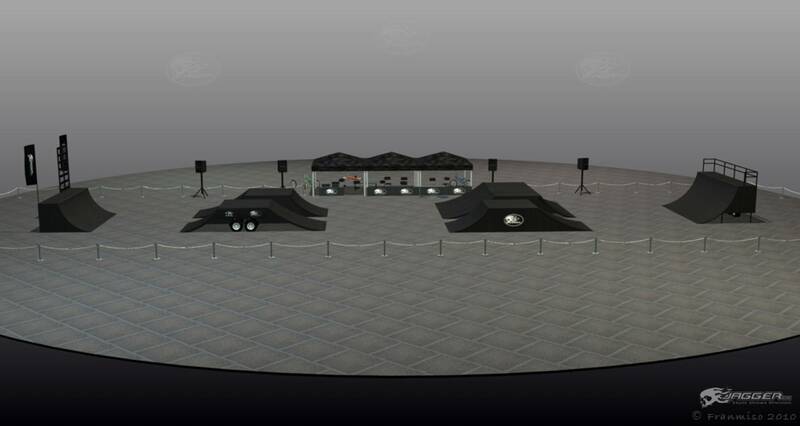 This out-of-this-world package includes four shows, and one huge finale where the FMX athletes fly over the street course, kamikaze-style, while it is erupting with stunts being performed by more BMX, in-line and skateboard athletes than you could imagine. Please take note that this show is not for the faint of heart!!! 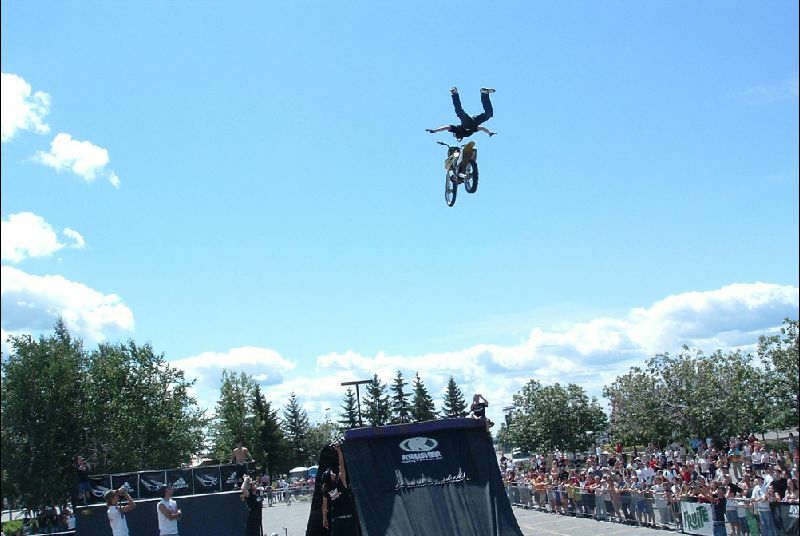 4 FMX athletes. 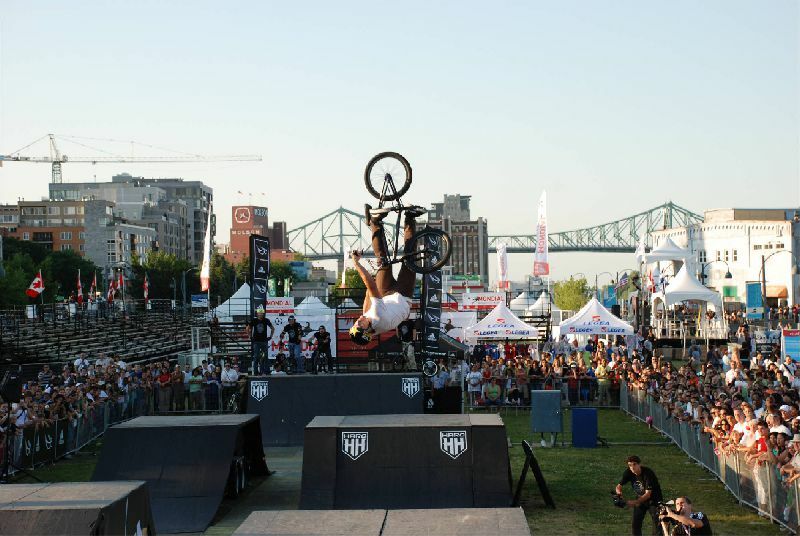 6 BMX athletes. 3 BLADE athletes. 3 SKATE athletes. 1 MC. 1 DJ. 1 TM. 6 Tech. Four 15-minute demos and one 30-35-minute grand finale. 300’ x 50’ minimum / High-quality asphalt, concrete. 18’. 2 x Landing Ramp Trailer 16’ x 15’ x 45’. Wallride 8’ x 12’. Pyramid Sub Box. 12’ Box Extension. Special Effects. Fan Club Zone. Skill Clinic. Giveaways. Tent Exhibitor Area. 6000-watt audio system. Thanks for filling out form! Someone will contact you wihtin 48 hours.